Gauteng premier David Makhura visited the Boksburg manufacturing facility of DCD Protected Mobility on a fact-finding visit. The economic contribution of defence companies to the provincial and national economies came under the spotlight on 24 November 2016 when Gauteng premier David Makhura visited the Boksburg manufacturing facility of DCD Protected Mobility, a member of the DCD Group. The fact-finding visit was part of a programme arranged by the Aerospace, Maritime and Defence Industries Association of South Africa. 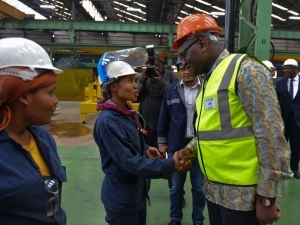 Premier Makhura was also able to tour the co-located factory of DCD's locomotive manufacturing company, DCD Rail. DCD Group CEO Digby Glover hosted the premier in Boksburg, along with DCD Protected Mobility general manager Cornelius Grundling and DCD Rolling Stock general manager Gary Steinmentz, highlighting the strategic importance of the group's heavy engineering and technological capacity within the South African economy. "With about 1 900 staff across the country, the DCD Group provides the country with access to high-level engineering expertise and facilities, with a strong research and development focus," said Glover. "This is vital for sustaining the economic foundation for growth and job creation." Grundling said DCD Protected Mobility was able to show the premier its market-leading offerings in the route clearance arena, which save lives through innovative design and high quality manufacturing standards.